The Footy Almanac recently ran a story by Rob Chanter about Australian Rules football in Toronto. Rob, a North Melbourne fan living in Canada, watched a game between his local team, the Broadview Hawks and Toronto Rebels. The ground at Humber College is pretty, Rob wrote, and well set up. Ringed by maple and elm trees around three sides, under the gaze of stately old University buildings on the fourth, with Lake Ontario 50 or so metres back behind the southern wing. Proper full-sized posts at each end, it’s clearly a dedicated footy oval. I’m told it’s a fairly recent setup, having been moved from the College’s Northern campus to avoid clashing with cricket (both being summer sports here). All the Toronto-based teams use this as their home ground, while outside Toronto there are teams in Guelph and Hamilton to the west, and all the way out to Ottawa in the east. Word is someone is trying to start up a club in Kingston too, about halfway to Ottawa where the lake becomes the St Lawrence River. Visit The Footy Almanac for all of Rob’s story, plus some more photos. 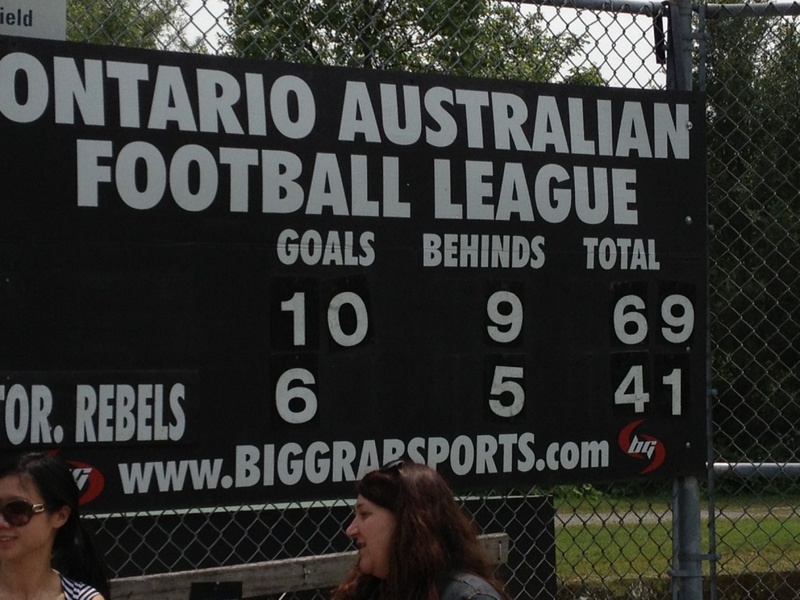 Rob also sent Scoreboard Pressure a Twitter photo of the scoreboard at Hamilton.